There hasn’t been much between them all season and in Saturday’s Junior Final, there was nothing. The Joe Brolly Cup remains in situ while Faughanvale and Drum wait to do it all again at Owenbeg this Saturday (surely there is a strong argument to finish a Championship final on the day!) after a match in which both passed up chances to claim victory. Both had legitimate claims to say they should be taking the trophy home but the fear of defeat seemed to restrict them at stages when they should have gone on to build match winning leads. Both were on the ropes, both in the ascendency and both missed chances which would have won the game. If anything, Drum probably had the best chances with three clear cut goal scoring opportunities either side of half-time. Had even one of those gone in, St. Colm’s would have been difficult to catch. But ‘Vale had chances too, though the fault with their finishing lay in decision making at crucial times as the game became stretched. Tactically, it was difficult for either to spring any surprises but both tried. If anything Drum perhaps were guilty of over-thinking a strategy which had them all at sea early on as St. Mary’s seized the initiative. Michael McLaughlin was immense at midfield for ‘Vale but it was all too easy in the opening minutes as the Drum players struggled to come to grips with their shape. The early loss to injury of midfielder Ryan O’Kane didn’t help but Drum seemed overly obsessed with stopping their opponents in the opening and Joe Gray’s side took advantage. The ‘Vale player-manager was well shackled all afternoon by Niall Burke but still had an important influence. He opened the scoring from a free six minutes in as ‘Vale built a 0-4 to 0-1 lead by the 26th minute. It should have been more. Drum players were looking isolated at this stage, their conservative approach meaning too often the runner in orange had little support and was forced to cough up possession. That changed with Donal Brolly’s rise in prominence. The little play-maker is as crucial to So. Colm’s as Gray is to ‘Vale and he had cut a frustrated figure in the early stages. His excellent 19th minute score signalled a change though and gradually he coaxed his team forward. Whether the wide open spaces of Owenbeg caught some of the Vale players out as debatable. John McLaughlin Park is every bit as expansive but Drum finished each half the stronger team though few would have foreseen them going in level at half time but they could have led. First Brolly’s high centre caused panic in the ‘Vale defence but Ryan O’Hara’s perfectly timed run and flick sent the ball inches over, rather than under, the bar. Another Brolly point in the six added minutes of first half injury time saw the resulting kick-out go straight to Conor O’Reilly but ‘Vale keeper Darryl Moore made amends with a brilliant one handed save even if he couldn’t stop Rory O’Reilly sending the rebound over the bar for 0-4 each at half-time. “We were disappointed to come in level,” admitted Vale player-manager Gray, “For at least 20 minutes we were on top but our shooting probably let us down and in the last 10 minutes we dropped back a bit and were put on the back foot. Fair play to Drum, they dug deep to come in level. ‘Vale did do well second half but not until Drum had passed up enough chances to win the game inside the opening 10 minutes. Rory O’Reilly, who looked to be carrying an injury, was guilty of missing a couple of frees he would normally bury but the key chance came when Niall Farren found himself clear on the ‘Vale goal on 34 minutes. The Drum player’s run was superb but - with a man free to his right - his tame finish wasn’t and Moore again came to ‘Vale rescue though Farren should not have afforded him the chance to. That miss seemed to signalled another swing of the pendulum. Trialing 0-6 to 0-5, ‘Faighanavle reasserted themselves with McLaughlin and Kevin Martin prominent. Martin drew the sides level before two Gray points, one from a free, put Vale in a position to go on and win the game. They could have too had they selected the right option on a number of pitch long breaks over the final 10 minutes. Drum were forced to become more cavalier in their approach but perversely seemed more at ease with the clear instruction circumstance had left them and defended well with limited numbers back. Niall Burke’s point came either side of missed chance for Gray and Kevin Martin which would have sealed the title for Vale but Drum never gave in. Their chance looked to have gone when Brolly, despite being in acres of space, skewed his shot badly wide of the left hand post with only seconds remaining. It would have been cruel on Drum, and on Brolly, had his miss cost them the trophy and it didn’t. ‘Vale hesitancy gifted Drum a free. Conor O’Reilly was handed the responsibility and when Marc McLaughlin was alert enough to work a short free with him, O’Reilly kicked a superb point to set up the replay. “I never thought it was gone, even at the end, because every team is going to get chances,” explained Drum midfielder McLaughlin, “Luckily we got the chance at the end and took it because I think we deserved another shot the trophy. 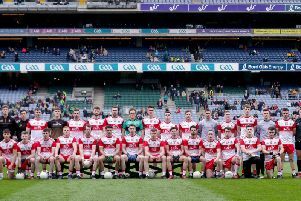 Drum: Cahair O’Kane; Liam Miller, Alex Moore, Naill Ferris; Damian Brolly, Shaun McGlade, Niall Burke (0-1); Ryan O’Kane, James McCartney; Niall Farren, Donal Brolly (0-3), Conor O’Kane; Conor O’Reilly (0-1), Ryan O’Hara (0-1), Rory O’Reilly(0-1). (Subs) Marc McLaughlin for R O’Kane (inj) 15mins; Conor O’Hara for J Moore, 34mins; Ryan King for O McKinney, 36mins; Corey Reilly for R O’Hara, 51mins; Paddy Moore for Rory O’Reilly, 55mins; Shane Millar for N Farren, 62mins.